This weekend in Jones Hall in Houston, Texas marks the second installment of the 3 week Beethoven series with the great Houston Symphony Orchestra. The fetching Mrs. B and I will be blessed to be in attendance as the feature piece of the night will be Beethoven's 3rd Symphony in E-Flat Major, known as the "Eroica" [which means heroic]. The Houston Symphony Orchestra's dynamic young exciting director, Maestro Andres Orozco-Estrada, will lead the HSO. This symphony has been called [from Wikipedia] a "structurally rigorous composition which marked the beginning of the creative middle period" of the great German master composer, Ludwig Van Beethoven. This symphony was named by Beethoven himself, the Eroica [heroic], that he first meant to publish as a dedication to Napoleon Bonaparte. In fact, on the original score, Beethoven wrote on the top, "in dedication to Napoleon Bonaparte". But just before it's completion in 1804, Napoleon named himself Emperor of France, and Beethoven was so outraged that Napoleon was going to become just like every other tyrant that he deplored, Beethoven scratched out the dedication he gave to Napoleon. In fact, in Beethoven's anger, he scratched out the dedication so hard it tore through the top page of his composition. Beethoven left the title as "the Eroica" in dedication to the heroes of freedom who oppose tyrants. 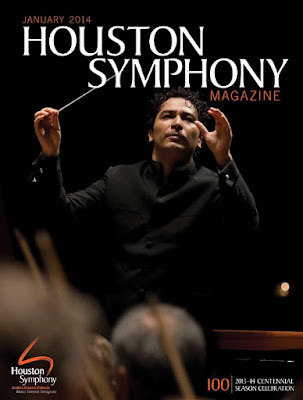 From the Houston Symphony Orchestra website: "Often hailed as the birth of the Romantic era, Beethoven’s heroic Symphony No. 3 changed music forever. Originally inspired by Napoleon, Beethoven famously scratched out the dedication to the French general after he crowned himself emperor, betraying the ideals of freedom that Beethoven so loved." The Heroic Symphony has four movements: 1. Allegro con brio, 2. Marcia funebre - Adagio Assai, 3. Scherzo, and 4. Allegro molto. Also, on this great concert program will be the exciting Piano Concerto #1 with trumpet and strings, by Dmitri Shostakovich. I have featured this concerto in an earlier post of "The Tales." The HSO website calls this concerto haunting and "darkly humorous." As always, when Sheralyn and I attend Jones Hall to hear the HSO, I like to feature just a sample of what we will be hearing. In the second video of Beethoven's Eroica Symphony #3, I have found a great You-Tube video which opens with a very good discussion of the history of this difficult composition of Beethoven. Thanks to Martial Vidz You Tube for this video of Daniel Barenboim conducting the West Eastern Divan Symphony at the 2012 BBC Proms in London. Also, Tales features the ultra-exciting finale of Shostakovich Piano Concerto #1. Please turn up the volume and enjoy. Thanks bro!! Amazing to me too! Wow Thanks Pamela- I have to find that movie- I didn't know. Thank you!